Registration includes 3 games of bowling and shoe rental. Only room for 22 teams, so sign up today! 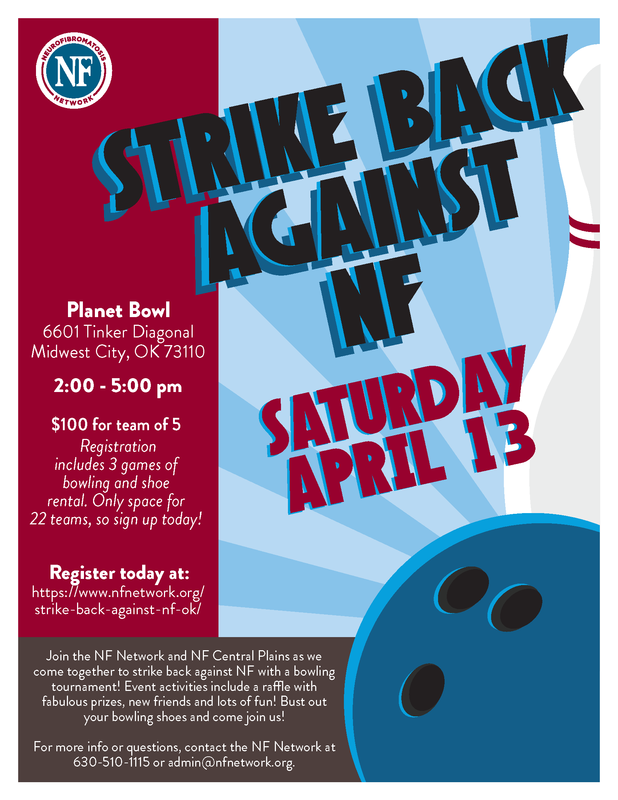 The NF Network and NF Central Plains invite you to the first ever Strike Back Against NF bowling tournament in Oklahoma! Come join us on April 13th at Planet Bowl in Midwest City, OK for an evening of bowling, raffles, and new friends! To download and print the event poster, click here. If you wish to fill out a paper form or to register by cash or check, click here for our paper registration form. For questions or more information, please contact Breanna at 630-510-1115 or bbronowskistutsman@nfnetwork.org. We hope to see you there!